This alarming rise has led to a call on governments in England and Wales to make it a criminal offence to own an air gun without a licence or permit. The survey showed that almost half of vets questioned had treated cats which had been the victim of attacks by air-powered weapons in the last year, with nearly half of these shootings proving fatal. The rise in fatal attacks suggests that more powerful air guns are being used. 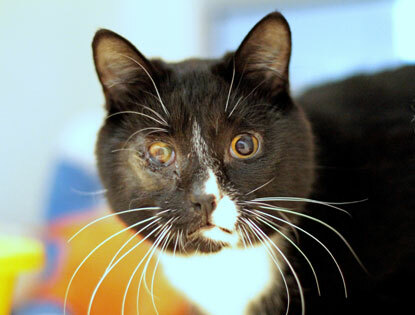 Injuries to the head and body are most common, with many cats left blind or partially sighted. Billy was left blind after an air gun attack in 2013. He was found with severe injuries in Lingfield, Surrey, by a member of the public and taken to a vet where X-rays showed he had been shot seven times. He was looked after at Cats Protection's National Cat Adoption Centre in Chelwood Gate, Sussex. Veterinary Officer Nathalie Dowgray said it was “a miracle” Billy had survived with such appalling wounds. “When Billy was found, he had very serious injuries – to his head in particular – and as a result he is totally blind in one eye, and may only be able to see shadows with the other,” she said. “He was severely dehydrated and wouldn't have survived for more than a day or two if he wasn't treated straight away. “He had so many puncture wounds it was first assumed he had been attacked by another animal, but when we looked at his X-rays we could see his whole body and head were literally peppered with air gun pellets. We can see four quite clearly embedded into his skull. The vet who treated Billy initially removed one or two pellets from his neck, but the others were so deep, particularly those in his skull, that it is not possible to operate and remove them. Cats Protection will continue to raise the issue of air guns with politicians across the UK. If any cat owners have lost their cat to an air gun attack in the last six months we’d be grateful if they could send any details to campaigns@cats.org.uk so we can collect more evidence about the scale of these attacks. Not disappointed a bit! I would suggest them to everyone! They are great!